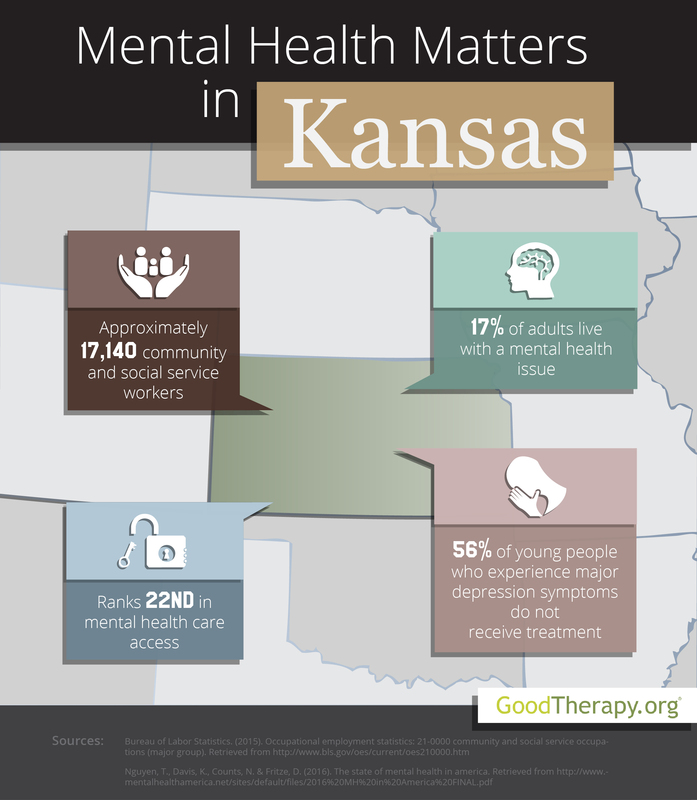 Find a therapist in Kansas with GoodTherapy.org. According to information from the Bureau of Labor Statistics (BLS), the year 2015 saw roughly 17,140 residents in Kansas working in social and community service fields. These residents were employed as depression therapists, child psychologists, health care workers, religious workers, at residential treatment centers, at rehab treatment centers, guidance counselors, social workers, and marriage and family therapists in Kansas. Therapists and other health care providers in the state earned an estimated mean yearly salary of $40,290. Data from the United States Census Bureau suggests these professionals served a state population of just under 3 million people in 2015. When all 50 states and the District of Columbia were evaluated in the 2016 Mental Health America (MHA) survey, Kansas received an overall rank of 15th for prevalence of mental health conditions and access to treatment. The state received similar rankings across other mental health measures, placing 15th in youth ranking, 16th in adult ranking, 14th in prevalence of mental issues, and 22nd in the ability to access mental health services. These state’s rankings are relatively high, but they do not place Kansas in the top 10, meaning overall prevalence of mental health issues is higher than states that do place in the top 10 and access to care is lower. According to reports from the Substance Abuse and Mental Health Services Administration (SAMHSA), more than 6% of teenagers in Kansas used drugs in 2012-2013—lower than the national average of just more than 9%. From 2009-2013, the percentage of teenagers in the state who perceived no major risk from smoking cigarettes daily decreased from 41.2% to 35.3%. The 2016 MHA survey indicates 5% of young people in Kansas are impacted by substance abuse issues involving drugs or alcohol; the state placed 7th in this category. The mental health services provided by therapists in Kansas appear beneficial for younger residents, as SAMHSA declares 81% of adolescents report better functioning after receiving treatment from the public mental health system—a significant increase on the 69% national average. The 2016 MHA study states that at about 17%, Kansas has the 10th-lowest percentage of adults with mental health issues. MHA researchers have identified other correlating social factors such as low rates of homelessness and high rates of graduation from high school for people with disabilities. Despite these findings, there are some concerns for psychologists and psychiatrists in Kansas. According to the SAMHSA 2014 study, the percentage of heavy alcohol use among the adult population in Kansas from 2009-2013 was higher than the national percentage over the same time period. The 2016 MHA study claims Kansas was ranked 25th for adults experiencing abuse of alcohol or drugs, 32nd for adults with mental health issues who did not receive treatment, and 25th for adults with mental health issues who have no insurance.